War tears people apart, but it can also bring them together. Through the unpredictability of war and its aftermath, a decorated Marine sergeant and a world-trotting war photographer became friends, their bond forged as they patrolled together through the dusty alleyways of Helmand province and camped side by side in the desert. It deepened after Sergeant T. J. Brennan was injured during a Taliban ambush, and both returned home. Brennan began to suffer from the effects of his injury and from the fallout of his tours in Iraq and Afghanistan. But war correspondents experience similar rates of posttraumatic stress as combat veterans. The causes can be different, but guilt plays a prominent role in both. For Brennan, it’s the things he’s done, or didn’t do, that haunt him. Finbarr O’Reilly’s conscience is nagged by the task of photographing people at their most vulnerable while being able to do little to help, and his survival guilt as colleagues die on the job. Their friendship offered them both a shot at redemption. As we enter the fifteenth year of continuous war, it is increasingly urgent not just to document the experiences of the battlefield but also to probe the reverberations that last long after combatants and civilians have returned home, and to understand the many faces trauma takes. Shooting Ghosts looks at the horrors of war directly, but then turns to a journey that draws on our growing understanding of what recovery takes. Their story, told in alternating first-person narratives, is about the things they saw and did, the ways they have been affected, and how they have navigated the psychological aftershocks of war and wrestled with reforming their own identities and moral centers. 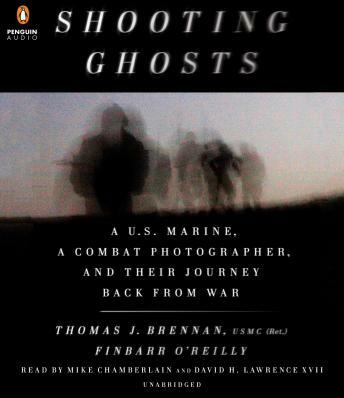 While war never really ends for those who’ve lived through it, this book charts the ways two survivors have found to calm the ghosts and reclaim a measure of peace.